The recent threats received in December 2015 by officials at the Los Angeles Unified School District (LAUSD) and in New York City resulted in two diametrically opposed responses. These are the two largest school districts in the nation. In Los Angeles, the administrators’ decision resulted in a district-wide school closure. In New York, the threat was considered a hoax and schools kept to an uninterrupted schedule. The effect of these decisions ranged from the costs of an intelligence analysis and a limited number of administrators making a decision to take no action to one closing down 1,531 educational sites. The LAUSD decision further resulted in the district potentially losing $29 million in state funding. Students were not the only people affected by the terrorist threat. 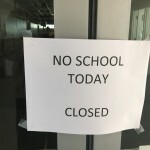 The disruption caused by the schools closing extended to students’ parents and guardians, parents’ employers, family friends, municipal transportation systems, day care and more. The disruption also provided cause for alarm in the Los Angeles County region, as the media provided breaking news alerts tied to the suspected terror plot. While it is always easier to view crises post-event, the measuring of potential destruction against acceptable levels of disruption is an action administrators must accomplish in a short period of time. An analysis of the actions of the two different sets of administrators can aid public and private administrators in developing a decision-making matrix for future events. A campus environment, particularly a complex system of campuses like that in Los Angeles, has unique challenges. Primary among them was the terroristic considerations Southern Californians had in the wake of the San Bernardino terrorist attacks—an event that had southern Californian administrators on strictest alert. The boundaries of LAUSD spread across 720 square miles and include the city of Los Angeles, as well as all or parts of 31 smaller municipalities plus several unincorporated sections of Southern California. In practical terms, the population of LAUSD is larger than Baltimore, Boston, Denver, Las Vegas, Portland and Seattle. Unlike a city where there may be specific targets, each of the targets in LAUSD would have the potential of creating a massive and devastating impact on a community since the likely victims would have primarily been between the ages of five and 17. The administrators charged with protecting the more than 640,000 students, 900 schools and 187 public charter schools did not have the latitude to determine which areas were more likely to be attacked. Therefore, the wise action was not to create panic, but rather to act in a prudent manner to protect the students and staff at LAUSD. Administrators at LAUSD also made this decision in the long shadow of an active shooter incident in 1984, where the actions of a lone gunman firing from across the street of an elementary school in Los Angeles injured 14 students and staff, including two fatalities. The idea of multiple attacks on school campuses could cripple a city if extremists successfully carried out such a plan. Now, with the most recent shootings in San Bernardino, Calif., the recent memories of such violent attacks only perpetuate prudent decisions by administrators as they ensure life safety remains the focus of their planning processes. Superintendent Ramon Cortines’ decision about exercising “an abundance of caution” received criticism by many security pundits and fellow administrators. While valid in a post-event analysis, what would these people have said if IEDs were discovered on school property or had one or more IEDs actually detonated? The decision to evacuate or close down a campus environment often includes limited information balanced against the potential loss of life. What is the appropriate level of concern when emails are received and reviewed by school officials that pertain to a terrorist’s desire to use bombs and guns to attack public schools? Is there a “right” or “wrong” response to such threats? The safety of children and the need to make decisions with limited information provided direction for this difference in the two responses from the east and west coasts. Although future administrators can utilize this experience as a future training opportunity, prematurely criticizing decisions as over-reaction involves far more than considering a simple comparison of perceived outcomes. The emails received by New York and Los Angeles administrators demonstrate how the same event can have different responses. These threats reveal the importance for campus administrators knowing how to make decisions in emergency situations. Emergency management is more than receiving basic training in emergency preparedness. It must include planning and practice drills built on realistic contemporary threats. Particularly, the need to train those outside of public safety career fields that may have to make decisions as part of their administrative responsibilities. Authors: Ygnacio “Nash” Flores, EdD, MBA, MPS, MA, is the dean of public safety academic programs at Rio Hondo College. Email: [email protected].